Want a fun way for guests to leave an imprint on your special day and a beautiful memory to hang on your walls for daily appreciation? 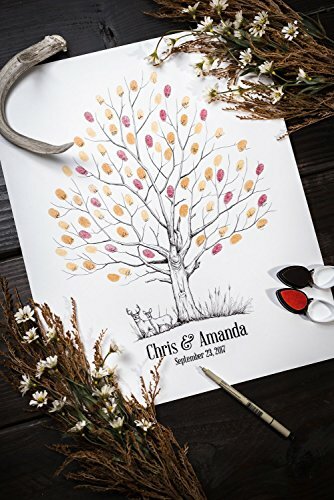 If so, this fingerprint tree will provide a beautiful alternative to the traditional wedding guestbook with a simple thumbprint. Guests will complete this colorful piece of art in a fun and unique way, capturing your wedding day (or any other special event) and providing a lasting memory. Unlike the traditional, boring guestbook (nobody wants to look at a book of signatures), this piece of artwork can be hung on your walls to be admired by family and friends. - Fingerprint drawing on paper with the names of bride, groom and wedding date, drawn underneath. -TWO ink pads with your choice of colors. These are drawn on 100lb, high quality bristol weight boards for finished artwork. This strong, enduring media will hold up well to hundreds of guests placing their prints along with future preservation. After your order is placed, I will send you a sample image of how your names and wedding date will look under the tree. PLEASE GIVE YOURSELF PLENTY OF TIME BEFORE THE EVENT. These are hand drawn upon ordering and could take 1-2 weeks at least depending on time of year and demand. Want something completely different? I will work with you for a fully custom design to fit your needs. If you have any questions about this product by LunsfordPencilArt, contact us by completing and submitting the form below. If you are looking for a specif part number, please include it with your message.